My Mom made money bread when I was in high school on Sunday mornings. My sister and I had never heard of it until one evening when we were making dinner. 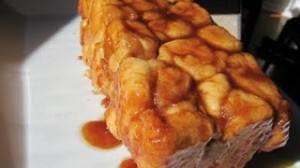 My Dad started to go on and on about “monkey bread” and how Mom used to make it all the time when they started dating. He told us about how she would roll it in butter and parmesan cheese, and when it was done it was the best thing he’d ever eaten. [Keep in mind that this was before we had eaten dinner, so it was killing us.] Well, he talked about it enough that Mom broke down and made this version – not with parmesan cheese – with cinnamon sugar. I haven’t had it in years, and I’ve certainly never made it before. This is definitely a method, not a recipe, but it couldn’t be easier. 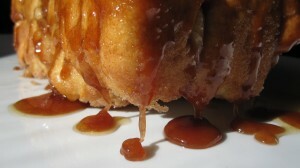 I am pleased to report that my monkey bread, while not as perfect as Mom’s, was SO good. I used a frozen loaf of bread dough – it’s in the freezer section – and followed the directions on the bag to proof it. For the brand I used (which I don’t remember off hand), I took the frozen loaf out on Saturday night, right before i went to bed. I put it on a greased cookie sheet and put it in the oven. On Sunday morning, I had a perfectly risen loaf of bread [that I was about to tear apart and add a ton of calories to]. I took the loaf out, and preheated the oven to 350 degrees. I melted 1/2 of a sick of butter, put about 2 cups of cinnamon-sugar on a plate, and buttered a bread pan. In the bottom of the pan put a nice drizzle of butter and cinnamon sugar, and mix it up. (If I had to guess, I’d say it was one tablespoon butter and 1 tablespoon cinnamon sugar). 4) Place in loaf pan. 5) Repeat until dough is gone. Once you’re done with that, put the rest of your cinnamon sugar on top of the loaf pan [or in the rest of your coffee], and bake it at 350 degrees, checking it after 30 minutes. I think this one baked for about 45 minutes. This is so good because the top is wonderfully crunchy from the cinnamon sugar, and the bottom is all gooey and . . . yum.